Monopoly Singapore Edition where Playtime Doesn't End Here! 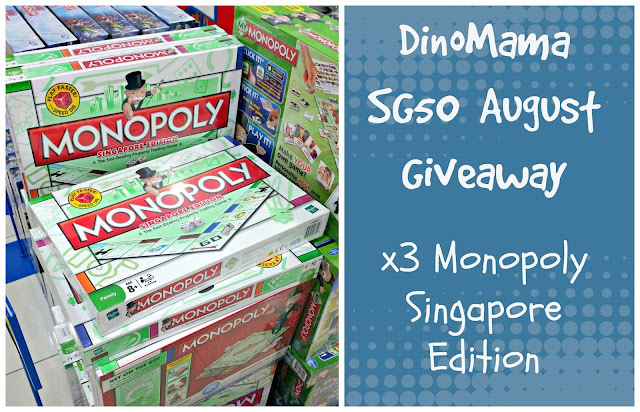 Our second SG50 August Giveaway is another iconic item, the Monopoly board game set. This is a game that accompanied us through many nights before the electronic gadgets days, I remembered I had so much fun playing with this with my siblings, cousins and friends. Monopoly has come a long way since the early 20th century and now we are spoilt for choices with many versions of the game. The Monopoly Singapore Edition brings to you the classic, fast-dealing property trading game where you play with the paper Monopoly money. Roll, buy, trade, build and win at the different locations in Singapore! 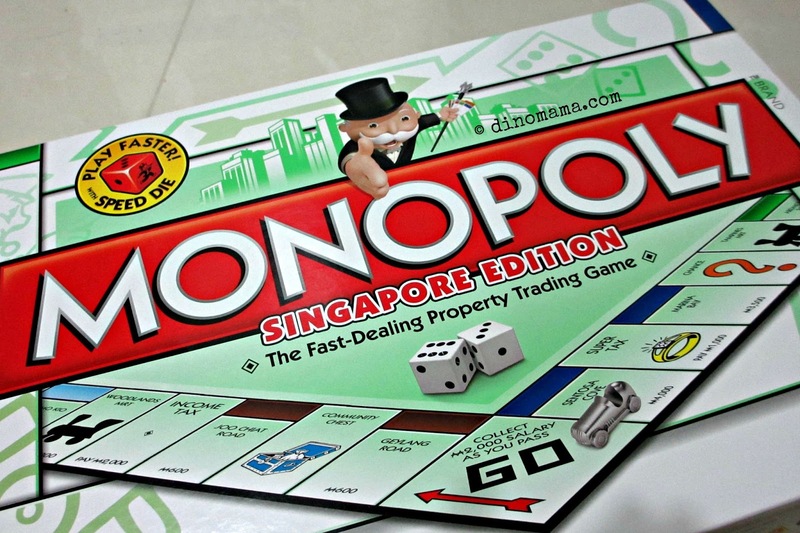 From Ang Mo Kio to Sentosa Cove, take a trip around the Monopoly board to see who wins it all! Monopoly Singapore Edition is retailing at SGD46.90, and is available at Toys'R'Us and major department stores. Well, you people knows that the DinoFamily love board games as it is a great way for family bonding, thus imagine how excited we were when we received a set of Monopoly Singapore Edition from Hasbro Singapore. We couldn't wait to play with it, especially DinoBoy since this is the first time he'll be playing it. Look he's is checking out the game set after I'm done taking photo for this blog post. We haven't made any concrete plan for this Jubilee Weekend but I have a strong feeling that we will be playing the Monopoly Singapore Edition board game. Perhaps we should get the rest of the family over to our place for a Monopoly game gathering while waiting for National Day Parade to begin. If you haven't had any plans like us, why not grab a Monopoly now? Here's another reason for you to get the board game. To celebrate Monopoly's 80th Anniversary they are having the Monopoly X Costa Cruise Lucky Draw Promotion from 24 July - 30 September 2015 where you stand a chance to win a fun-filled 6D/5N Costa Victoria Balcony Cabins for a family of 4 with minimum $30 purchase of any Monopoly set. *Terms and Conditions apply. The entry form for the lucky draw can be downloaded here. Alternatively, you can try your luck in our giveaway. 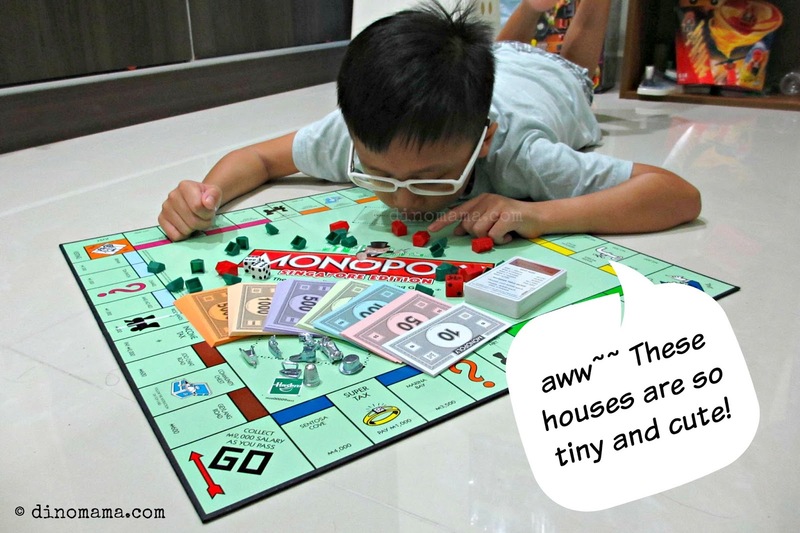 Disclaimer : We received a set of Monopoly - Singapore Edition for the purpose of this post & giveaway, no other forms of compensation were received. All opinions are 100% ours and all photos in this post unless otherwise credited, are copyrighted and belongs to the DinoFamily, you may not use any of the photos for any purposes without seeking our approval. We like to go swimming, fishing, and go to the library together. We also have family game night every Friday night. We like to go to the Park near our house to cycle or play ball games. the activities that my family and i love to do together are baking , play badminton , cycling , play some game like UNO or snake and ladder , have picnic too and also watch some show at home and snack chip together . We absolutely love playing board games as a family! Scrabble, pictionary, taboo, monopoly and more! Would love to have the Singapore edition to let my boy learn more about our home! :) Thanks for the giveaway! Some of the activities we do together as a family include reading together, baking, playing board games, toys, sport activities like swimming, cycling, etc. We love family bonding moment and it's fun and enjoyable. We cycling at park on weekends, go for picnic at beach during school holiday and visit library together once a week! We love to play games such as clue jr, uno, pick up sticks. We love going to the park on weekend morning. Thks for the giveaway! My boy loves the junior monopoly, time to upgrade to the adults version n this will come in handy. I would love to win Monopoly Singapore Edition for my family's extra new activity. Every weekend, after finishing church sunday morning mass, we hang out for breakfast and groceries shopping together. We always plan and organise BBQ for dinner at our house backyard and have a good time and laughter for bonding session because for us, family is very important than everything else. ♥ Thank you very much for the chance of giveaway! We are not a very outdoor family, we enjoyed playing board games and card games such as Ludo, Snakes & Ladders, Monopoly and Uno. We bought my two children to Dragon playground of Toa Payoh (located at Blk 28 Toa Payoh Lorong 6) last sunday afternoon (02 Aug 2015). It is the only one of its kinds (sand-based) left in Singapore. One of Singapore's few remaining heritage playgrounds (from the 80s) in lieu of #SG50! This playground was designed by Khor Ean Ghee in 1979. It was our childhood memories of favourite dragon playground too. We have so much fun, laughter and family bonding together !!! Definitely be back more. 2) catch movies, the latest movie: Jurassic World. esp my younger boy love dinosaurs too much. 5) playing board games e.g. Junior Monopoly board game, & Minions Monopoly board game. 7) Visit to Bird park which we enjoy a lot esp we enjoyed the 2 bird shows. 8) Gardens by the Bay and children playground; the children simply love the environment and the free sand play. My mother in law aka their grandmother joined in the fun with their two grandsons to visit River Safari & Gardens by the Bay for the past two months. This is another way of bonding with the grandparent. We love the free outdoor parks like Labrador park ! 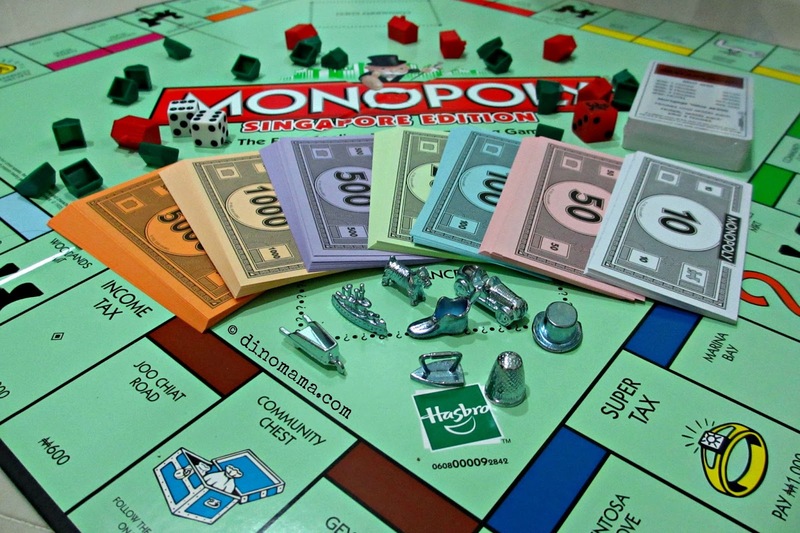 We love monopoly games and would love go add the Singapore edition to our games! Thanks for the give-away! On a rainy day like today, our family bond by playing Happy Family and Old Maid and baking muffins together. If the weather permits, we love to build sandcastles and enjoy our picnic at the beach. We love to go to the park as a family! We love to play puzzle together. Different sizes different themes. Hope to win a set! I enjoy going out for a walk in the park with my family. Playing scrabble and other board games. From marketing to preparing and serving of food. The kids enjoy choosing the ingredients (and they get to know the name of the items), peel the vegetables, distribute the utensils etc while daddy and mummy whip up their best dishes for the family. An outdoor activity will be sandcastle building. This require family effort to build an enormous and spectacular sandcastle. The kids improve on their motor skills and the adults have fun together with the sun, sea and sand. We love to go park and we love play to games at home too. Hope to win Monopoly set so we can play during the weekends. We usually do Flashcards, Photographic memory (Shichida ChiChak), Funbook, Smartbook together. At times, we will also do some craft together. This helps in developing their fine motor skills. Both activities are not only fun but it helps them to develop their creativity and thinking skills. These activities are great for family bonding and you can play with it for hours and hours without getting bored because you can build a creation over and over again. They can also be used as a role play activity and have a fun time together. Hope to get lucky for my kids so that we can have more family bonding fun with each other. We like to sit down together to play board games together. Hope to win tis fun & special board games for my kids as they really love all the names of singapore street.